Bill Pendergast and his wife Carrie have a million reasons to smile. A Newfoundland man who lost everything in the 2016 wildfires that ripped through Fort McMurray is able to finish rebuilding his home, thanks to a $1-million lottery win. 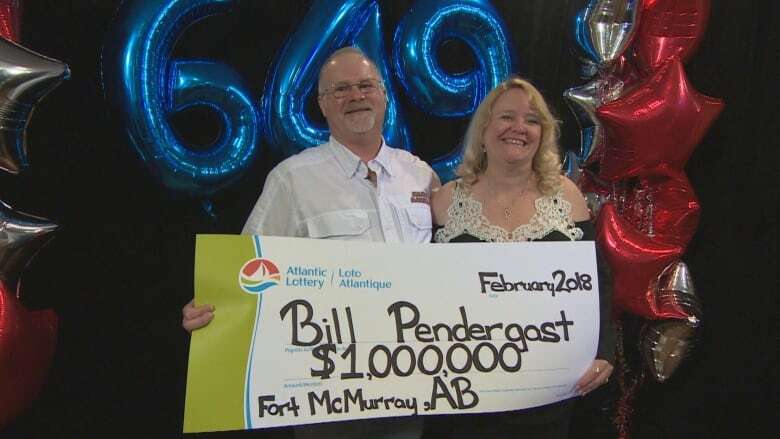 "It's pretty awesome looking at the bank account with all those zeros," said Bill Pendergast at a ceremonial presentation by the Atlantic Lottery Corporation in St. John's on Friday. Pendergast bought his winning 6/49 ticket in the Goulds neighbourhood of the city while on a visit to Newfoundland to spend time with his ailing father. When the ticket scored a big win in the Feb. 3 draw, he couldn't believe it. The money allows him to contemplate retirement a little earlier than he expected. He's also eyeballing the Mustang he always wanted, as well as a family vacation. But the immediate payoff is getting back to normal at his home in Alberta. "In the wildfire, May 2016, we had a total and complete loss, so this puts us one step closer to getting that all finished," said Pendergast. "Our rebuild should be finished in the next two to four months so this is going to go a long way towards that." His family is looking forward to spending some of the money on fun. "Between myself and my wife Carrie we have five boys, definitely taking a family vacation, so they're in the process now of updating their passports." It was the third time in as many days that the Atlantic Lottery Corporation handed out a cool million. David Head of Gander Bay picked up his winnings on Wednesday while another jackpot was claimed in Glace Bay, Nova Scotia on Thursday.